This is what passes as civility for the progressives. 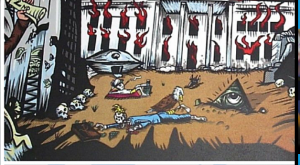 A poster promoting the band Pearl Jam’s August 13, 2018 concert in Missoula, Montana is being described as “reprehensible.” The poster, which is a collaboration by Pearl Jam bassist Jeff Ament and the artist Bobby Draws Skullz clearly depicts the skeletal remains of U.S President Donald Trump, as well as two Montana congressional candidates: Senator Jon Tester and Republican challenger Matt Rosendale. In front of the chaos in the front left corner is a man holding up what appears to be a U.S. Constitution and a reference to the 2nd amendment, while on the other side is Republican Senate Candidate Matt Rosendale with a lobster claw for a hand waving a flag that says Maryland. The most confrontational image on the poster is front and center. Below the flames of the White House, sprawled on the ground is the skeleton of President Donald Trump, with his signature hair still intact, reaching for a briefcase emblazoned with a hammer and sickle while an eagle feeds on his carcass.